In Borne, a village in the Netherlands, one can find a remarkable installation by the young Dutch artist Harmke Koning. 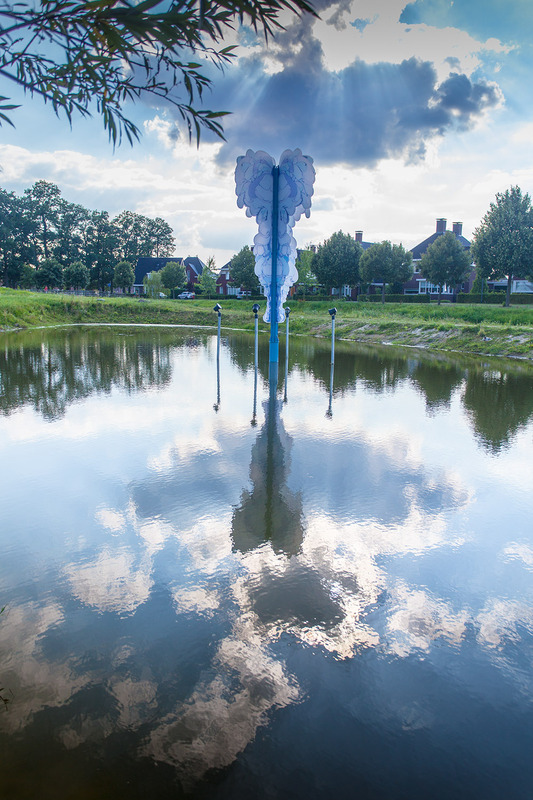 This work, titled Cloud Tree, is an object of a few meters high, transparent and light, that stands in the middle of a pond. In strong wind it dances gently back and forth, in the bright sun the work becomes almost transparent and seems to change its form. When the sky is dark, the cloud tree looks like a drawing on the firmament. When blue with cumulonimbus, the colours and shapes of Cloud Tree are reflected in the water and merge with the fleecy clouds above. Harmke Koning found the inspiration for Cloud Tree when she was on a personal retreat. She went back to the basis of her creative work by focusing entirely on her drawings. In the weekend during this time of reflection she went to a concert of the indie rock group Low, which took place in an old church. The beauty of the light on the large majestic columns of the church gave birth to the idea of columns in the open air. 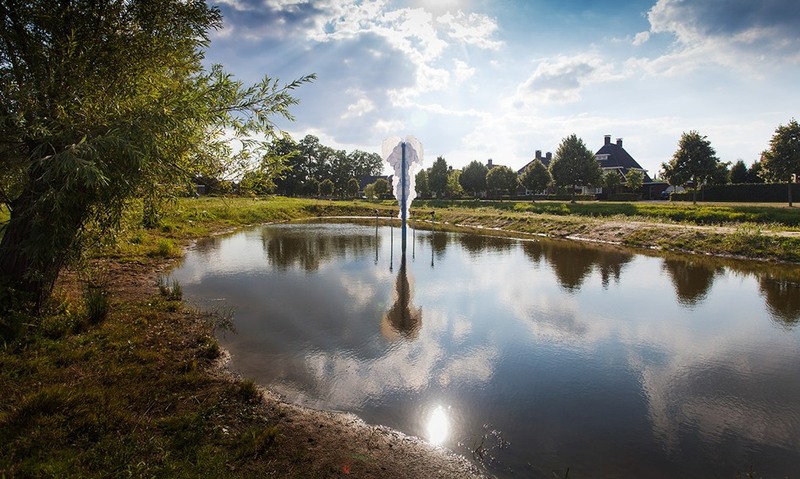 When the council of Borne commissioned Koning to make an artwork for the Bornsche Beekpark, the notion materialized of a column of drops of water, which would stand in the middle of the pond. 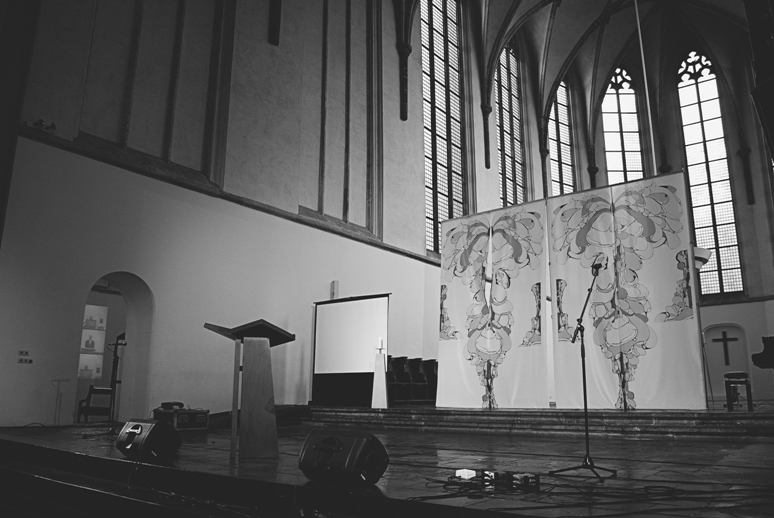 In 2013 four pieces of cloth with images of Cloud Tree printed on them were shown during the Geestdrift Festival in the Janskerk inUtrecht. Her columns of water drops hung like a modern veil in the choir of this medieval church – in an old church, just like the space where the inspiration for the work originated. Looking at Cloud Tree a number of associations may come up. With this tree Koning seems to seek a connection between heaven and earth. Rising from the water it raises up like an offering of smoke clouds in order to return to the pond as a blessing from above like the caress of the pool of Bethesda. The drop shapes of Cloud Tree are reflected by the water, while they merge with the blue of the firmament and the woolly white clouds. A fusion of below and above. 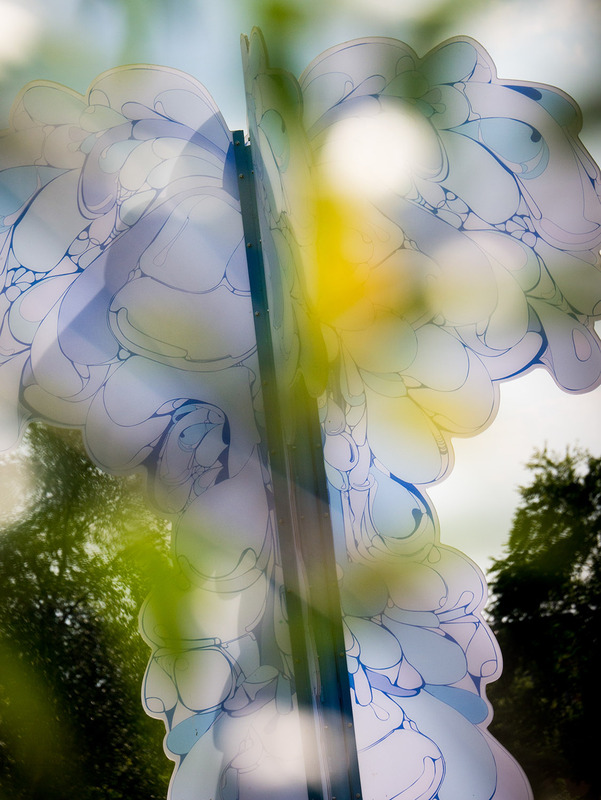 Harmke Koning: Cloud Tree, 2013, 4 meters high, detailed illustration pressed into environment friendly synthetic material. Harmke Koning develops artworks that give new meaning to a landscape, building or location. She studied at the Hogeschool voor de Kunsten Utrecht in Utrecht, The Netherlands. Her graduation project was shown in the CentralMuseum in Utrecht. This video installation with animation was at the same time a climb and play object for children. She has developed several large installations for festivals. For the past six years artworks for the public space has been her main focus. Harmke Koning also develops creative workshops for elementary and secondary schools. Zie http://www.harmkekoning.nl. Miranda van Holland is an art historian who works for the Dutch Evangelical Broadcast Company (EO), where she has made radio programmes for many years. She never lost sight, however, of her first great love of art.